Dinosaur trackways have been around for a while, and biblical creationists are giving them quite a bit of attention lately. Although soft tissues in dinosaurs and other critters have been found, defying deep time speculations of secularists, tracks are also problematic for secular scientists. The Brobdingnagian trackways down yonder in South America are worthy of note. We know that tracks made in sand, clay, or other squishy stuff are not likely to fossilize because this process must happen rapidly and under the right conditions. 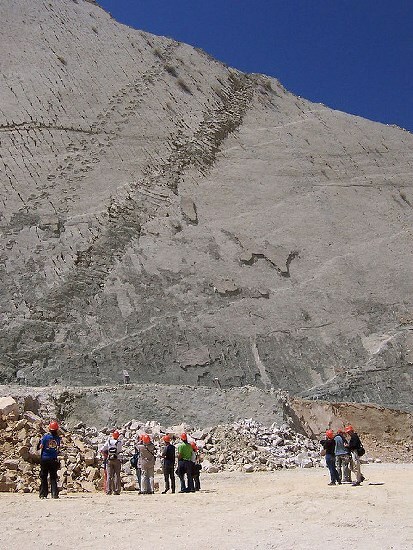 The Cal Orcko tracks are numerous, first discovered in 1985 by a limestone mining company. When further tracks were uncovered in the 1990s, they realized that a bit of a mountain full of tracks existed. If you have a notion to see the trackways for your ownself, better get a move on because they may not be available much longer. Interesting that they can be seen deteriorating in just a few years, but secularists expect us to think they lasted for millions of Darwin years, isn't it? No, the various dinosaurs were not taking a hike up the hill. That formed much later when the land was uplifted by plate tectonics instigated by the Genesis Flood. Also, they appear purposeful, as if all of them were fleeing, not dancing. After the fossilization process and uplifting, the mining company's discovery caused consternation and weak speculations among secular geologists. Creationists do not have any difficulty with the find, which supports Flood models. In 1994, Bolivian workers quarrying high-grade limestone for cement reached a layer with too much quartz, a hard mineral, so they left it alone. As quarrying continued, more and more of the unwanted layer was exposed, forming a huge cliff and revealing hundreds of dinosaur trackways. The tracks are of at least eight different kinds of dinosaurs, including a pair of titanosaurs and a herd of 16 ankylosaurs. The layer also contains the longest dinosaur trackway in the world, over 500 m (1,640 ft), by a small theropod, possibly a juvenile Tyrannosaurus rex. These rocks are part of the El Molino Formation which extends over much of Bolivia. The Vilquechico Formation of Peru and the Yacoraite Formation of Argentina contain similar dinosaur trackways, and all three are suspected to be merely different parts of the one continent-wide formation. To finish reading, click on "The Cal Orcko (‘Lime Hill’) dinosaur trackways". The video below has some interesting pictures. Note the weak secular "explanation" of how the footprints formed, the obligatory "millions of years", and how the apparent fleeing was ignored.